With the most recent update to Power BI Mobile, we are excited to announce our preview of phone reports. Much like with our previous feature, phone optimization for dashboards, you can now create report views that are optimized for your phone. We all want our data to fit into our pocket, be available everywhere, and allow for easy interaction. Power BI Mobile apps aim to meet these goals and bring you a great mobile experience. The biggest challenge for reports on phones is finding the right amount of interactivity on a small device screen. Displaying data in a clear way on a small screen requires re-sizing visuals, but in turn that can change the ease of interactions. With the new phone-optimized reports feature, you can specifically tailor a portrait view of your existing report on Power BI Desktop for mobile viewers. Once you publish your report to the Power BI service, it will be available to all mobile users on any screen size. All of the scaling and resizing is handled automatically. On top of the custom view, we have introduced a variety of features to enhance and optimize the experience of using reports on phones. Adding a phone-optimized view for reports during the authoring process is fast and easy. The concepts are similar to the Mobile dashboard experience, except that for phone reports the authoring is done in Power BI Desktop. The phone view is configured per report page, so for each page you can choose which visuals you want to make available and which you prefer not to include in the mobile view. You can also resize all of your report page visuals and allocate them inside the phone frame as you’d like. Please note that changes will only be applied after publishing the report to the Power BI service and will only affect the report layout when viewing it on the phone in portrait mode. The web view of the report remains the same and rotating the phone to landscape will show the default report as shown on the web. For a step by step guide on phone reports see our documentation. Once you published your phone report to the Power BI service it will be available to all users who have access to that report. You can easily navigate between report pages by swiping right or left with you finger or by choosing a specific page on the new report menu. To maximize the real estate dedicated to your data if you scroll while viewing the report on your phone the top bar and action menu will collapse and allow more space for your content. 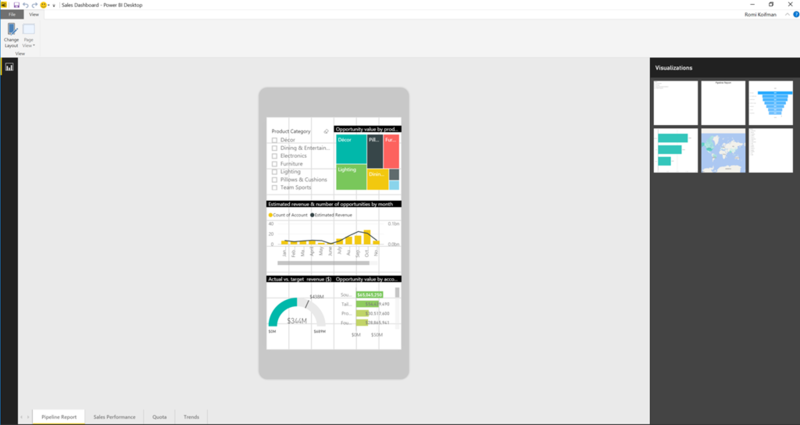 Just like with any Power BI report, you can select any visual on your phone-optimized report page to cross filter and cross-highlight the other visuals on the page (See Visualization interactions in a Power BI report). Advanced mobile capabilities such as Barcode scanner and Geo filtering are also available in the phone report menu. Mobile interactions are unique; you need to use your fingertips to touch the data on a small screen. To improve this experience, we're introducing a new focus mode for report visuals. Open this mode easily by double tapping the visual or using the (…) menu. This mode expands the visual to full screen and makes data interaction easier. But wait, there's more! The new phone view contains two more enhancements available in the visual focus mode: Sort and Drill down. You can sort your charts as defined to reorder your data on the visual. If the visual has a hierarchy in place, you can drill down and up using the explore menu. Any sort, highlight, or drill your do inside the focus mode will persist to the report when closing this mode and going back to the report canvas. Want to start over? You can revert all exploration actions with a single click using the new revert icon in the bottom menu. Another major and exclusive improvement in phone reports is the report slicer. Report slicers are a great way to narrow the portion of the data shown in the other visuals on the page. Previously, the downside of slicers were that if you have a lot of values the slicer may take up a lot of space of the report page. Now with phone reports, you can minimize the slicer to show a minimal number of values. But what about the values that are hidden? The slicer's focus mode is specifically designed to show all values available. You can also search for a specific value to slice by, and use the clear button to clear the slicer values. As mentioned above, if you go back to the report your slicer selection will persist and slice all the other visuals in the page. We truly believe that optimized phone reports offer a better consumption experience across devices, and allows mobile users to do more with their data. 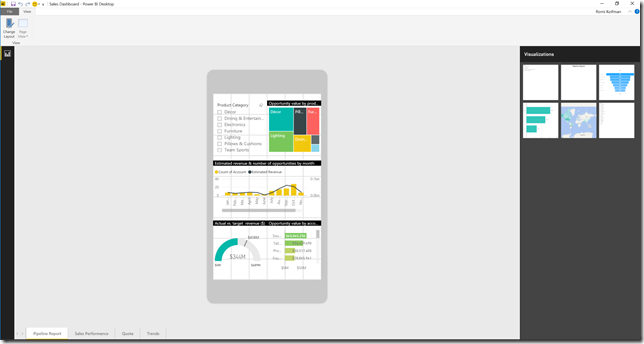 For more tips on Power BI Mobile apps and phone optimization, check out our documentation. Have any feedback or questions? Want to have input on how we develop this preview? Be sure to post in our community forum!